Lasagne is one of those dishes that can and should be just a bit different each time you make it. 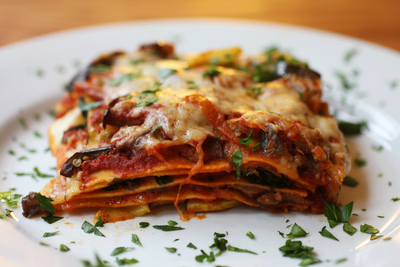 This is a rich lasagne and may seem labor intensive, but it is worth every moment of each step. Prepare the various ingredients before cooking the lasagna, so the noodles don’t have too much time to stick together. This is another remarkable creation from the Holden Village kitchen … with thanks to my ‘co-creators’ with whom I shared countless hours in that mystical, magical, majestic place! In a bowl, hand mix cream cheese, ricotta and sour cream. Add to tasted: the salt, fresh ground black or white pepper, oregano or basil. Minced garlic and lemon zest. If you are using fresh basil, cut herb into small ribbon strips with a kitchen scissors. Set this mixture aside. Chop the onion and mince the garlic. Melt the butter in a 1-quart sauce pan; add chopped onion and minced garlic. When the onions are transparent, add flour to make a medium roux. Stir as you allow the roux to cook on very low heat for 12-15 minutes. Turn the heat up and add chicken stock (and a bit of white wine if you’d like). Season to taste. A Note Regarding the Noodles: Cook the lasagne noodles until barely done. They are easier to handle if they’re a bit stiff. Rinse the noodles with cold water and lay them out individually so they don’t clump during the building process. Be sparing in the use of the garlic Velouté sauce, and keep the layers of cheese sauce thin. Excessive us of these ingredients can result in a runny lasagne. Cover and bake in a 375º degree oven for 1 ¼ to 1 ½ hours. Remove the cover / foil for the last 15 minutes, or so, of baking. Let the lasagne sit out of the oven for 15 minutes before serving. This helps it set so it dishes up more easily.